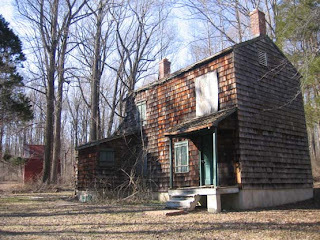 Located towards the edge of Herrontown Woods--a 100+ acre nature preserved donated to Mercer County by the Veblens, the Veblen farmstead includes a house, cottage, small barn and corn crib. Shown here is the cottage and, in the distance, the small barn. The two-story section of the cottage, and the barn, appear to be structurally solid, due to intact roofs. The floor joists of the cottage are a question mark, and will require an inspection of the basement. Veblen used this cottage as his study. It dates back to the 1860s. Oswald Veblen comes from a prominent family. His uncle was Thorstein Veblen, an internationally renowned economist and author of "The Theory of the Leisure Class." For those of us entertaining the idea of turning the Veblen farmstead into a sustainability center, it's interesting to learn that Thorstein Veblen coined the phrase "conspicuous consumption." The home of Thomas and Kari Veblen (Oswald's grandfather), located in rural Rice County in southeastern Minnesota, went through a similar eleven year period of abandonment and decline before steps were taken to restore it. Now a national landmark, more information can be found at http://www.mnhs.org/preserve/shpo/veblen.html, the website from which this photo was borrowed.